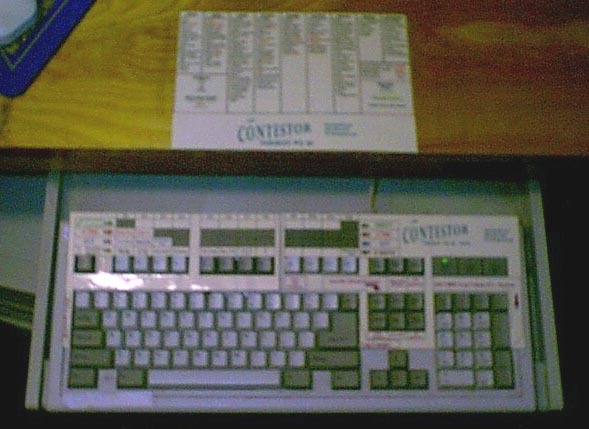 As an active contester, I saw the need for a keyboard overlay for the CT contesting software, showing all commands and functions at a glance. We have developed an overlay made from 110# heavy cardstock, in full color, with plastic lamination on both sides. These overlays are indespensable for contesters, veteran or rookie, and slide right over your IBM style keyboard. The price for either the CT , Writelog or RTTY Overlay is $14.00 plus $2.50 each shipping and handling. Please note, there are two models. 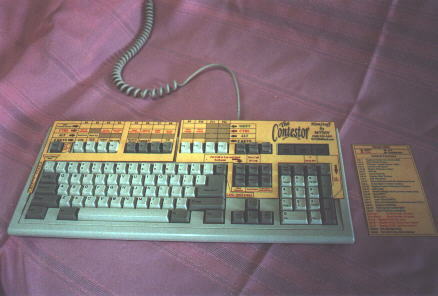 The WIDE model is for keyboards with 3/4" spacing between the top number keys and the function keys, and the NARROW model is for keyboards with 1/4" spacing. 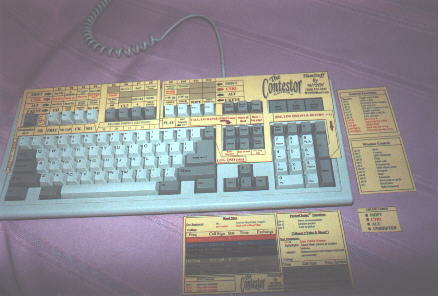 We also carry the keyboard overlay for the popular WF1B RTTY contesting software. As with all our overlays, please order the RTTY-W for the WIDE keyboards, and the model RTTY-N for the NARROW keyboards.The price for the RTTY overlay is $14.00 each plus $2.50 shipping and handling. We now carry the overlay for WRITELOG. As with all our overlays, please order Narrow or Wide. Please also specify if you have Writelog set up as "CT Compatible". The price is $14.00 each plus $2.50 s/h. We are also now carrying the Universal Overlay. The Overlay is modeled after the CT overlay, but informational fields are blank. Use this overlay for your day to day logging software, or TR Log contesting software, or any software where a large fill in the blanks Overlay will be helpful. The price on the Universal Overlay is $11.00 plus $2.50 s/h. We also carry permanent ink pens or erasable ink pens for the Universal Overlay. The price for either pen is $2.00 with free s/h with any other order.